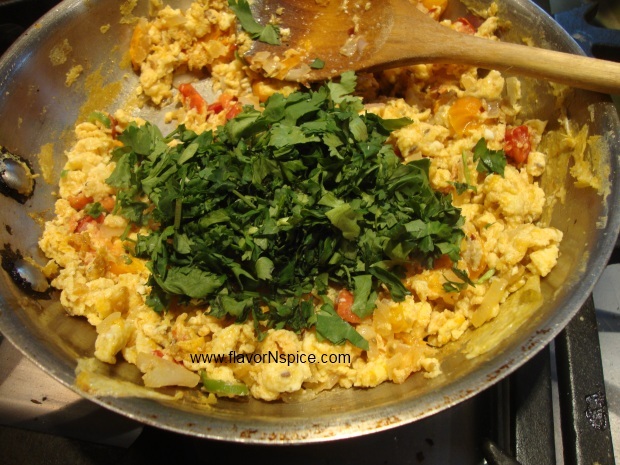 I woke up this morning and even before I could grab my first cup of tea, I found a picture of Indian Scrambled Eggs posted on facebook by David Rocco, with a title that stated – “Woke up craving Anda Bhurji”! I knew that David Rocco had recently spent a few weeks in India, and he was there to shoot some television program. Over the past weeks he’s been posting such wonderful pictures of his adventures in my part of the world, but who would have “thunk” that a Canadian-Italian with shows on every known food channel in the world would be craving such a simple Indian dish! I found this quite amusing and in my rush of excitement, I posted it on my husband’s fb wall. I should have known this simple gesture on my part would come back to bite me. As soon as my husband saw the picture, he came out of his home office with a big grin on his face and I knew what that meant – he’s going to ask me to make this for him! Scrambling the eggs is simple but there is major work involved in making the fresh Indian flatbread that goes with the eggs (I have to knead the dough by hand and roll each one out and cook each one, individually, one the flat pan!) I quickly checked my freezer to see if I had any previously frozen ones but alas, I didn’t have any. Well, this is what happens when both the husband and the wife work from home and both their kids are in college – we end up entertaining ourselves with food. 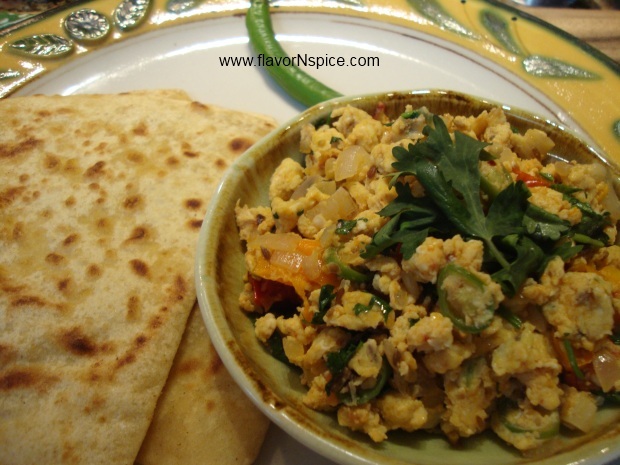 Yes, I did make the spiced scrambled eggs for him and I made the Indian layered flat bread (Paranthas) and that made him very happy (as a reciprocal gesture he made me a great cup of espresso – so it worked out well for both of us). Yes, I took pictures while making the eggs and decided that if David Rocco can post pictures of this ubiquitous yet simple Indian comfort food, I can put the recipe up on my blog. 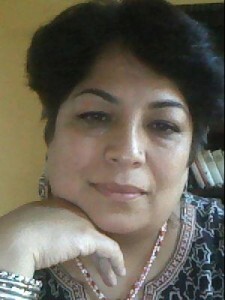 Most of my readers are not Indian and they have no idea what they are missing – eggs, scrambled this way, taste wonderful! If you can’t find the Indian flat bread/Paranthas (although you may be able to find it in any Indian/South Asian grocery stores in the US and the one I prefer are the ones sold under the brand name “Deep”), you can always substitute them with warm pita bread or flour tortillas or even a hot buttered toast. 3. 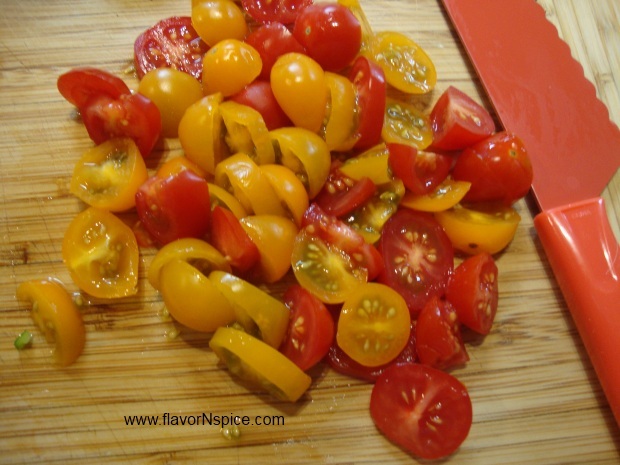 Also chop the tomatoes. 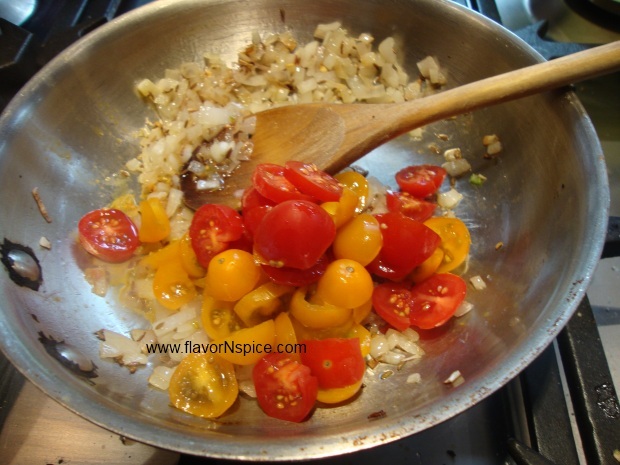 I used red and yellow grape tomatoes because I like colorful dishes – you can add any kind of tomatoes you have. 4. 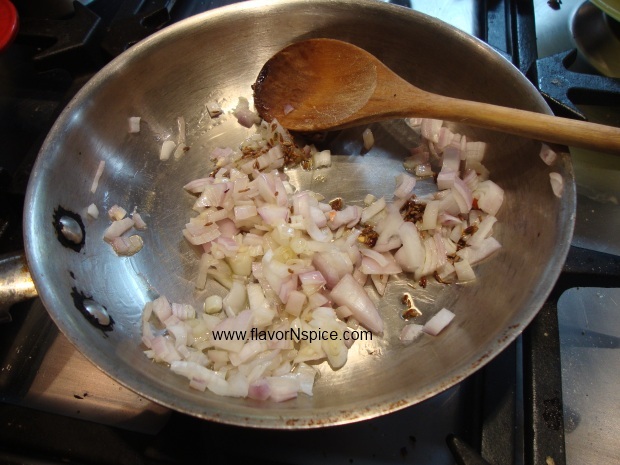 Heat the oil in a small sauté pan and add the cumin seeds to it. 5. 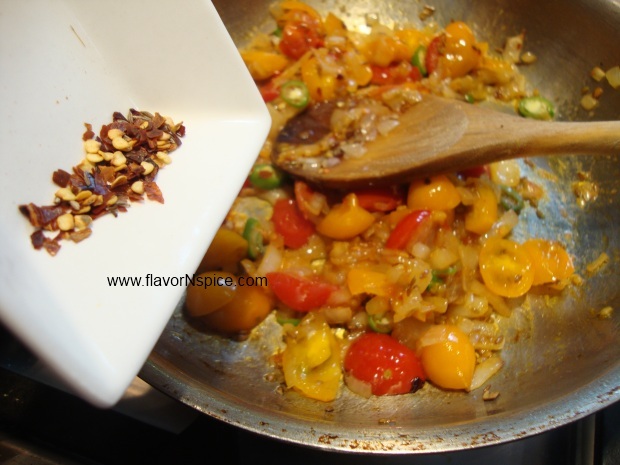 The cumin seeds with begin to sizzle in 10-12 seconds and at that time add the diced shallot to the pan and stir everything. 6. 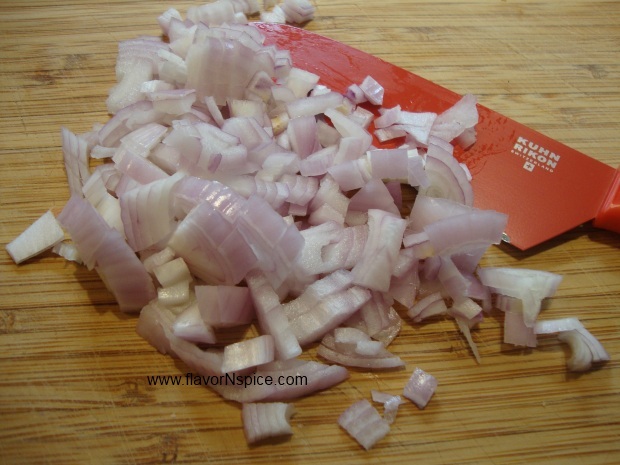 When the pieces of shallot begin to get translucent (takes 2-3 minutes), add the chopped tomato to the pan and stir. Cook on medium heat for 1-2 minutes. 7. Now add the chopped green chili and stir. 8. 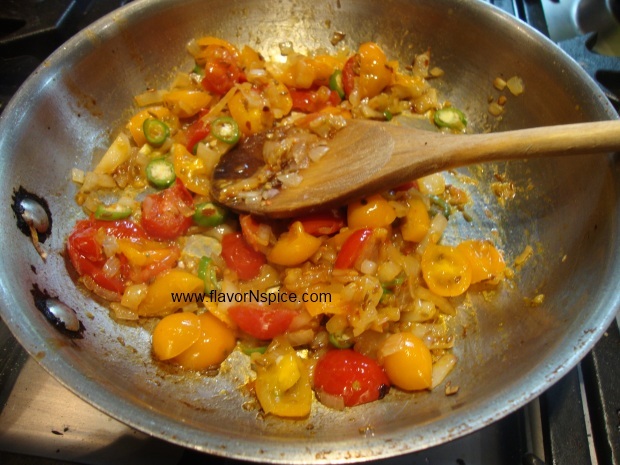 Add the red pepper flakes and stir. 9. 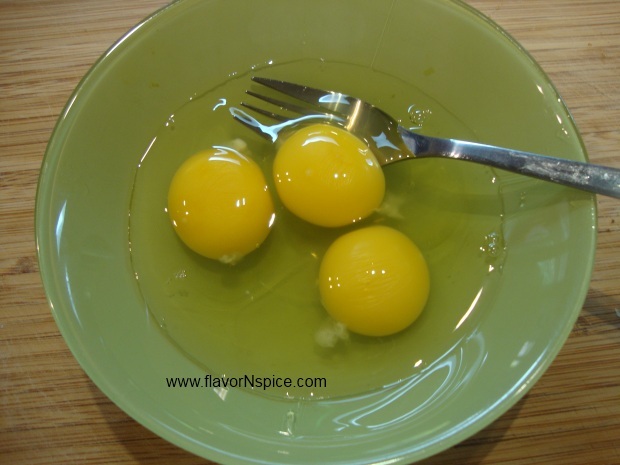 Break the eggs in a small bowl. 10. Add salt and whisk the yolks and the whites. 11. 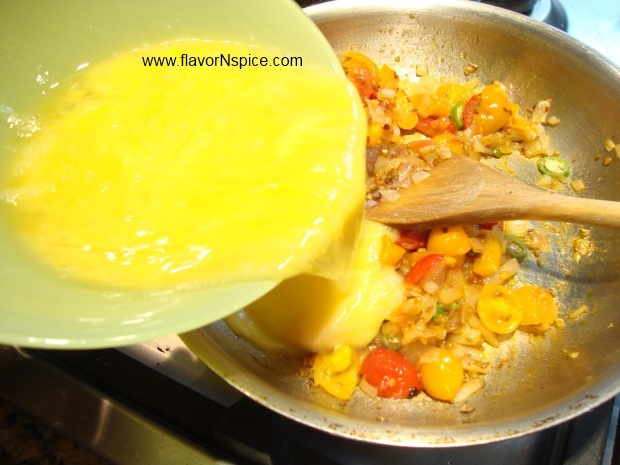 Immediately add the eggs to the sauté pan and stir everything rigorously. 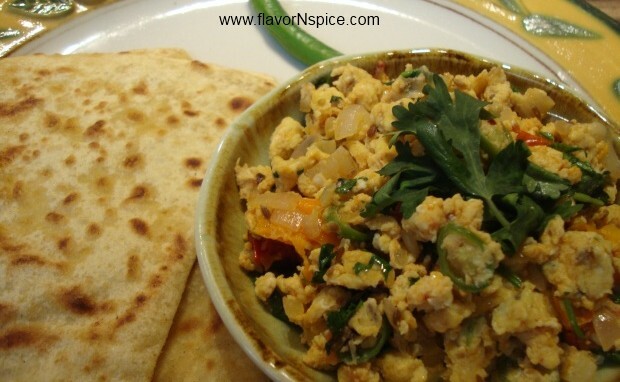 Indian scrambled eggs are not supposed to be lumpy, so you’ll need to stir constantly. If anything seems to be sticking to the bottom of the pan, scrape it off with a wooden spatula andcontinue stirring for 2-3 minutes. 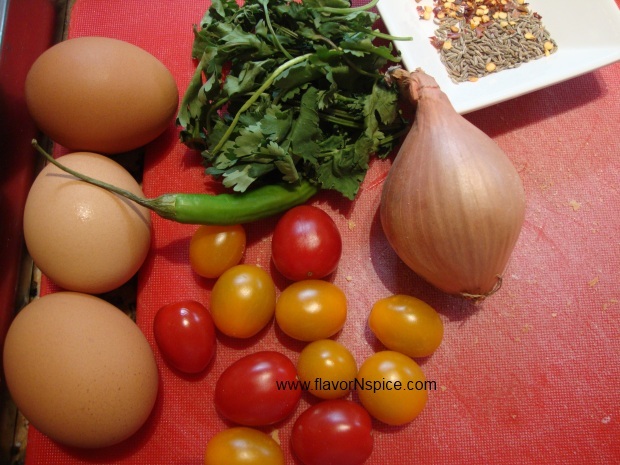 The bits of shallot and tomatoes should get completely mixed with the eggs. 12. 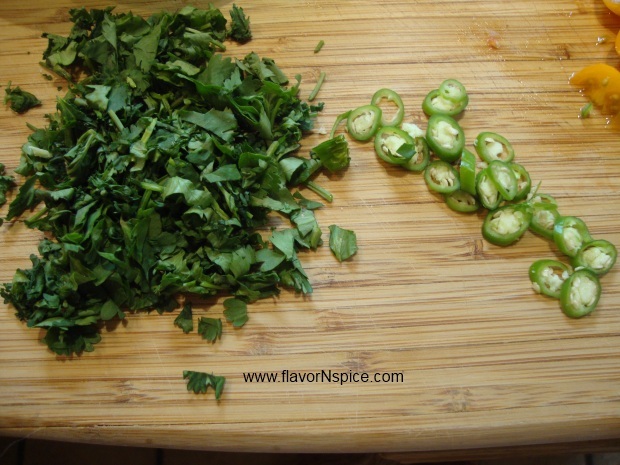 At the very end, switch the heat off and add the chopped cilantro leaves to the eggs and stir everything together again. 13. Serve immediately with any kind of flat-bread or a piece of hot buttered toast. 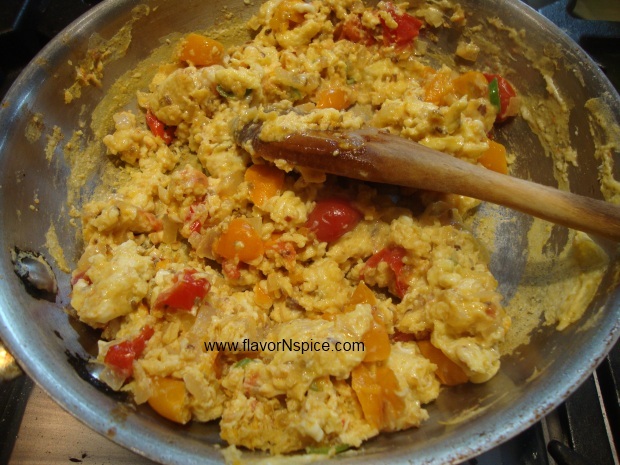 These scrambled eggs make for a delicious weekend brunch! Looks really yummy! Have to try! Thanks! Hi Shilpa, I haven’t tried the Parsi style eggs (will look up the recipe for them on-line) but this is the standard North Indian way of doing eggs. Yes, Amul cheese brings back happy memories 🙂 that was the only kind of cheese available in Delhi back then and that too it was not even cheese since it was processed cheese but oh how we used to love it!!!! Mmmmm…. Amul cheese! My hubby still throws in a couple of tins into the suitcase everytime he goes to Delhi! This looks so delicious. Definitely making it for breakfast this weekend! 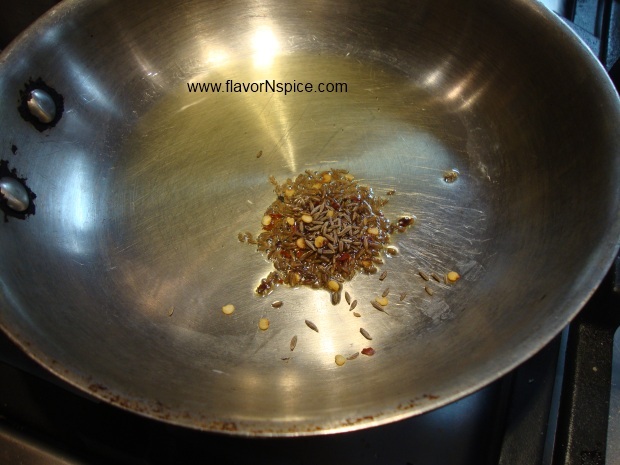 Hi Janell – welcome to FlavorNspice 🙂 Let me know if you try this or any other recipe and how it turns out. I’d love some feedback!! !